The mirrorless camera is a lighter, compacter, and more economical alternative to the DSLR camera model. Mirrorless cameras preserve a fair amount of the power provided by DSLR cameras while being slightly more packable. While retaining the DSLR’ s interchangeability of lenses, the mirrorless camera makes gives users a live view system instead of making them rely on a viewfinder. With mirrorless cameras, hobbyists and professionals alike to have options for high-caliber photography quality without needing to break the bank. The following products are some of the best-reviewed mirrorless cameras on the market that can be purchased for under $500. The Nikon 1 J5 mirrorless camera features 105 phase-detection autofocus points out of 171 autofocus points in total. The camera is capable of shooting up to 20 frames per second continuously. It has 1080/6p video resolution, and a tilting touch screen that can be rotated 180 degrees. With the EXPEED 5A engine, the camera is optimized for advanced processing. For the owner’s convenience, the camera features built-in Wi-Fi capability as well as Near Field Communication (NFC). The camera has been specially designed to have a strong spread of autofocus technology. The Nikon 1 J5’s autofocus features include contrast detection, phase detection, face detection, single touch, continuous touch and more. With the camera’s average battery life, it can remain operational long enough to take 250 successive photographs. The supported battery type is EN-EL24 lithium ion. When capturing videos, the camera has 1920 x 1080, 1280 x 720, 720, and 4K resolution. The video capture format is MPEG-4, H.264. The maximum display resolution is 1037000. The camera has a manual Hybrid AF focus type, with 171 contrast detection and 105 phase detection. As for exposure control, the camera uses camera offers Program Auto, Shutter Priority, Aperture Priority, Manual, and Scene Auto selection. The camera’s continuous shooting speed is about 60 fps, and the shutter speed is 1/16000th of a second. The maximum horizontal resolution is 5,568, and the minimum shutter speed is 30 seconds. The camera’s optical sensor is powered by CMOS technology, the photo sensor uses BSI-CMOS technology, and the optical zoom is capable of reaching up to 3x. Flash modes include Auto, Fill-in, Flash off, Red-eye reduction, Second curtain synchro, and slow synchronization. The camera’s flash is built-in, and the flash sync speed is 1/60th of a second. It features a self-timer, a sensor cleaning method, and a touch focus screen. Every picture that is taken is saved in the JPEG (EXIF 2.3, DCF 2.0) and Raw (12-bit compressed NEF) format. Included the Nikon 1 J5 package is an EN-EL24 rechargeable lithium-ion battery, an MH-31 battery charger, a UC-E20 USB cable, an AN-N1000 strap, a BF-N1000 body cap, an LF-N1000 rear lens cap, and a user manual. Customers should be advised that the Nikon I J5 isn’t designed for weather resistance and doesn’t come with external memory or GPS included. With all of its process enhancement features, the Nikon 1 J5 is capable of operating at a speed that can rival most DSLRs on the market. The camera can manage to create a certain degree of image quality in low light that most compact cameras aren’t capable of reaching without extensive upgrades. The Nikon 1 J5 has a cropping function accessible in Review Mode. In addition to being able to crop their pictures, users can also take their pictures in sepia, high contrast B&W, HDR, and vivid filters. If users install the Wireless Mobile Utility App from Nikon on their smartphones, they have the ability to connect their camera to the app via Wi-Fi. If desired, users can choose to use the lens from Nikon models other than the lens that is included with the J1 by default. The only other lenses that users won’t be able to fit onto the J5 are the waterproof 1 AW1 lenses. By using the FT-1 Adapter, users can mount other F-mount lenses onto the Nikon 1 J5 as well. Many reviewers have testified that, for its value, the Nikon 1 J5 exceeded their expectations for what a compact mirrorless camera should be capable of. One customer testified that before discovering the Nikon 1 J5, they had experienced some real frustration at not being able to achieve true colors for a proper white balance. The customer found that the 1 J5 gave them the true colors that they had been seeking all along. In addition to the aesthetically pleasing color balance, the customer also found that the responsiveness of the user interface was pleasantly swift after being synchronized with their Wi-Fi. 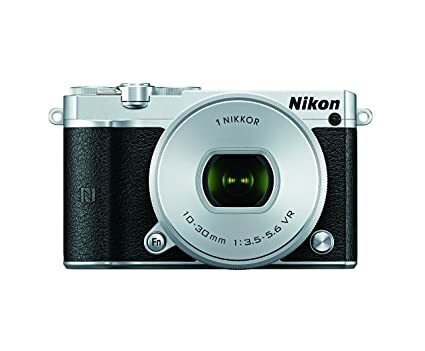 Another reviewer who had tried the camera’s older versions stated that the Nikon 1 J5 was much speedier and dynamic than all of the models that had come before it. The reviewer had particularly good things to say about the camera’s ergonomics, which they state had been improved over older models with a small hump to facilitate a better grip. The biggest improvement over the camera’s predecessors that the reviewer noted was the performance of the sensor. The Nikon 1 J5’s dimensions are 2.36 x 1.26 x 3.86 inches altogether. The unit weighs approximately 0.51 pounds, and the shipping weight is 1.3 pounds. The camera is available in one of three different color variations for the body: Silver, White, and Black. The Nikon 1 J5 can be purchased with its 10-30mm PD-ZOOM lens for $496.95. 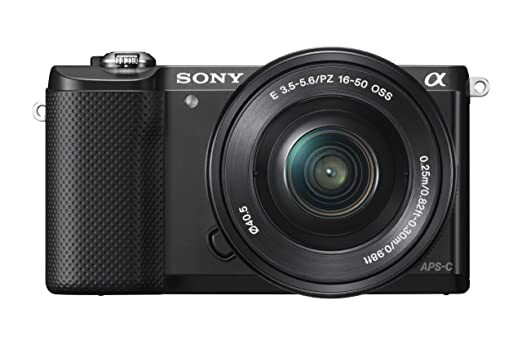 The Sony Alpha a5000 can produce images of an enhanced quality with its 20.1 MP Exmor APS-C sensor. Not only do users have access to the power of a DSLR camera in a more compact form, but they may also freely interchange the lens. The camera can be connected to the users’ smartphone via Wi-Fi connectivity using NFC. The camera’s autofocus technology features contrast detection, face detection, live view, single shooting and continuous shooting. There are 12 autofocus points in total, and the image aspect ratio can switch between 3:2 and 16:9. The camera’s average battery life allows approximately 420 successive photographs to be taken before it runs out of power. The energy content within each of its lithium batteries equates to about 2 watt hours overall. Included in the Alpha a5000 package are NP-FW50 Lithium ion rechargeable batteries, an AC-UB10 USB AC charger, a Mini-B USB cable, and a shoulder strap. It is compatible with both Sony FE and Sony E (NEX) mountings. The camera’s continuous shooting speed is 3.5 fps and the digital zoom can enhance up to 2x. The display is a tilting 3” LCD with 460800 resolution. The minimum ISO is 100, and the maximum ISO is 16,000. The maximum shutter speed for the camera is 1/4000th of a second, and the minimum shutter speed is 30 seconds. Maximum horizontal resolution is 5,456. The metering can be toggled between Multi, Center-weighted, and Spot. Optical sensor resolution is 20.1 MP, and the optical zoom is 3.1x. Both the photo sensor technology and the optical sensory technology are powered by CMOS. The camera can be remote controlled via smartphone, features an ultrasonic sensor cleaning method. There is a single USB 2.0 port, avchd video capture format, and a video capture resolution of 1080p_hd. The Alpha s5000 features a highly accommodating array of different exposure control features, including iAuto, Superior Auto, aperture priority, shutter priority, scene selection, and sweep panorama. The camera’s compatible flash memory types are SD, SDHC, SDXC, and Memory Stick Pro Duo. The camera does not come with external memory, GPS, flash type manipulation, image stabilization, weather resistance or water resistance. Some customers have testified that the Alpha a5000 might possibly offer the best image resolution for its price. One reviewer mentioned that the camera’s image quality is largely owed to the new Bionz X imaging processor and the sensor. The only downside that the reviewer mentioned was that they found the LCD screen could be tad bit sharper, but nevertheless still allows users to effectively determine the optimal focus for their images. The reviewer went on to praise the auto focus speed for being particularly impressive for a camera that was designed for contract detection. They believed that the biggest reason for people to invest in Sony mirrorless cameras is the fact that the APC-C sized sensor performs much better in low-light than Micro four third options. Another customer testified that they were a novice when it came to photography, but at the same time, they found the interface and features easy to acclimate to with just a bit of practice. The customer stated that they mainly use the camera’s auto function and that it manages to take aesthetically-pleasing photos even in low-light settings. The Sony Alpha a5000’s dimensions are 2.8 x 1.42 x 4.33 inches, and it weighs about 0.59 pounds. The camera body is available in three different color variations, including Black, Silver, and White. The Alpha s5000 can be purchased with a 16050mm lens for a $448.00. The Panasonic Lumix DMC-GX1 camera features a 16MP Micro Four Thirds sensor. It is capable of continuous shooting at 4 fps and has 23-area contract detect focusing. The minimum ISO is 160, and the maximum ISO is 12,800. The video resolution is 1080 HD, and the display is 3.0-inch LCD touchscreen with 460,000 dots. The autofocus technology features multi-area, selective single point, contrast detection, face detection, tracking, live view, single shooting and continuous shooting. The battery type is lithium ion, each weighing 44 grams and supplying 1,010 mAh of energy content. The camera’s maximum shutter speed is 1/4000th of a second, and the minimum shutter speed is 60 seconds. The maximum horizontal resolution is 4,59. The metering can be toggled between Multi, Center-weighted, and Spot modes. The camera is compatible with all Micro Four Third mounts, and the digital zoom can reach up to 4x. The minimum ISO is 160, and the maximum ISO is 12,8000. The flash mode types are Auto, Forced Off, Forced on, Red-eye reduction, and Slow synchronization. The flash memory types are SD, SDHC, and SDXC. External memory is included with the standard camera package. The flash is built-in, and sync speed is 1/160 seconds. Focus type for the camera is automatic with some manual functionality as well. Optical image stabilization is included in the camera’s settings by default. The image aspect ratio setting for the camera are 1:1, 4:3, 3:2, and 16:9. 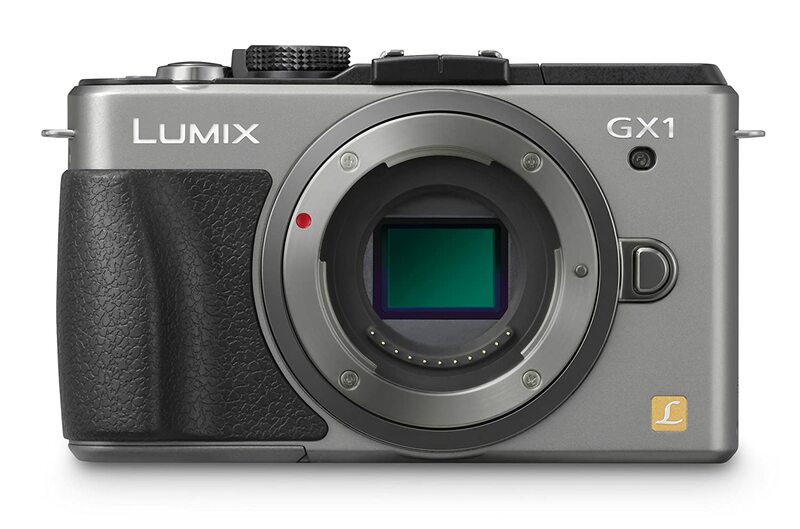 The Lumix DMC-GX1 has a Venus Engine FHD processor and uses a supersonic wave filter for sensor cleaning. The optical sensor resolution is 16 MP. The optical sensor technology is powered by MOS, while the photo sensor technology is powered by CMOS. If the user wants, they can use an optional DMW-LVF2 electronic viewfinder to take their pictures. Pictures taken by the Lumix DMC-GX1 are exclusively saved in the raw format. The Lumx DMC-GX1’s video capture format is exclusively avchd, and the video capture resolution options are as follows: 1920 x 1080 (60 fps), 1280 x 720 (60, 30 fps), 640 x 480 (30 fps), and 320 x 240 (30 fps). Prospective buyers should be advised that the camera’s metering could potentially result in some instances of underexposure if overly conservative. The video recording controls don’t offer much in the way of manual exposure adjustment. If continuous track performance is a high priority for the owner, then they may not be entirely satisfied by the camera’s slight drop in continuous tracking quality when shooting in areas that have low contrast and low light. The camera does not feature GPS, water resistance or weather resistance. The Lumix DMC-GX1 is a camera that many people can confidently consider to be near the top in the quality that consumers can expect from a Micro Four Thirds camera. Customers testify that they’re pleased with camera’s durable metal body and the ergonomic rubber grips to help them keep a firm hold on it. Overall, the camera is best suited for use by photography hobbyist who are looking for respectable picture-taking power in a compact size. For its value, the AF acquisition is quite swift and capable of holding its own in low light environments. Users who are interested in Micro Four Thirds lenses that can deliver a decent ISO range will be quite pleased with what the camera has to offer. The Lumix DMC-GX1’s dimensions are 2.68 x 1.54 x 4.57 inches overall, and it weights approximately 0.7 pounds. The camera comes in two different color variations for the body: Silver and Black. The Panasonic Lumix digital camera can be bought for $429.00. The Olympus E10 digital camera features a 16 MP Four Thirds CMOS sensor with three axes of sensor shift image stabilization. The camera is capable of up to 8 fps of continuous shooting. All images captured by the camera may be saved in either Raw or Jpeg format. Users have access to a 3” LCD touchscreen with 1,037,000 dots that can be freely tilted for convenience. The minimum ISO is 200, and the maximum ISO is 25,6000. The flash is built-in, and it’s compatible with the Olympus Wireless RC system. In addition to the built-in flash, Wi-Fi is also built in. The camera has a card slot that accommodates SD, SDHC, and SDXC cards. The Olympus E10’s battery life allows for approximately 320 photos to be taken before running out of power. The battery type is lithium-ion, with each battery weighing 1 gram and providing about 7.8 hours of wattage. The maximum shutter speed is 1/4000th of a second, and the minimum shutter speed is 60 seconds. The lens is interchangeable, and the maximum horizontal resolution is 4,608. The optical sensor resolution is 16 MP, and the optical zoom can reach up to 3x. Both the optical sensor technology and the photo sensor technology are powered by CMOS. The camera has a TruePic VII processor and a supersonic wave filter for sensor cleaning. The maximum resolution of the tilting LCD screen is 1037000, and the effective still resolution is 16.1 MP. The expanded ISO minimum is 100, and the expanded ISO maximum is 25,600. Exposure control types include Manual, Aperture Priority, Shutter Priority, Programmed Auto, iAUTO, Scene Selection, Bulb, Time, Underwater, and Art Filter. Overall, the Olympus EM10 is best suited for photography students and street photographers who are looking for a camera that they can use to hone their developing skills while still having access to flexible customization. The stabilization is compatible with every different kind of lens and the AF is quickly responsive. Along with the dual control wheels, users can customize the buttons to make using the camera feel more intuitive. Customers should be advised tha¬¬¬¬¬t the quality of JPEG images might start to get a bit distorted at ISO levels about 3200, and the video quality may not be quite as sharp as picture quality. 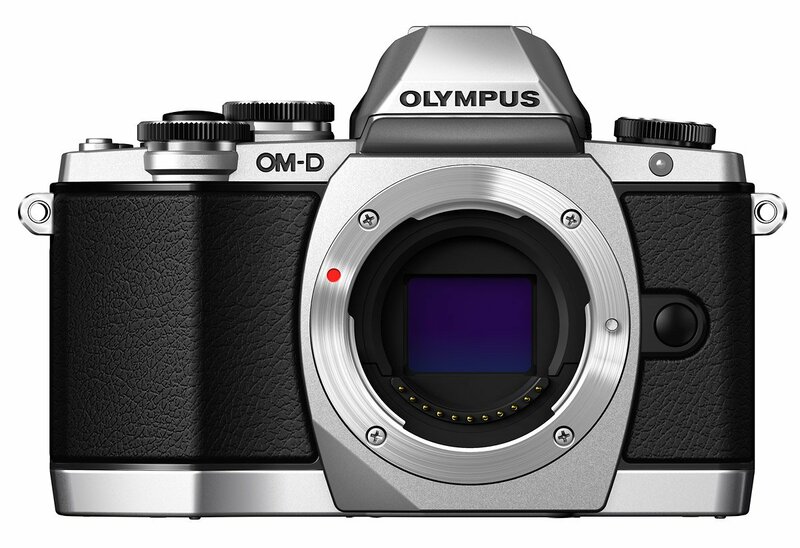 The Olympus EM10 camera’s dimensions are 3.24 x 1.81 x 4.69 inches, and it weights around 0.87 pounds. The camera’s body is available in either a black or silver color, and it can be purchased for a $349.99. Perhaps the most vital aspect of choosing a digital camera that will best suit your needs is the power of the sensor. Simply put, the sensor is responsible for the camera’s ability to digitize light. The sensor is able convert all of the light it absorbs into an organized digital file with the use of photo sites, and depending on the camera that you’re considering, these photo sites in question will have certain level of light sensitivity. Generally, the product information of any camera will tell you its sensor information-storing capacity in terms of megapixels. Many people make the assumption that a higher amount of megapixels is always indicative of higher quality in general, but if you want to make the most educated decision for your ideal camera, then you should refrain from prejudging camera quality based on the megapixel number. When considering which camera is going to give you the best-quality photos, the sensor’s pixel count will be factored into a host of accompanying factors in the picture-taking process, including: the shakiness of the camera, the camera’s unique software, and the sophistication of your lens. Most photograph hobbyists usually won’t have much need for a megapixel count that is all that much higher than 10. Bigger is not better when it comes to megapixels, but when it comes to the size of the sensor, savvy camera shoppers will generally have a different attitude. When it comes to the size of the sensor, you usually can’t go wrong by investing in just about whatever the biggest size is that you can afford. Cameras with large sensors are a big factor in what allows serious photographers to take pictures with strikingly professional quality. You’re not going to find the biggest sensors on the market with any camera that’s under $500, but even at the more economically priced levels, the size of sensor will still result in noticeable difference in the picture quality that you’re capable of. Rather than getting your heart completely set on a full-frame sensor, it would be more feasible to focus on getting a camera that has an APS-C or Micro Four Third sensor. Your camera’s sensitivity is simply how light-sensitive the digital sensor or film is. When you’re thinking over which types of digital camera to buy, pay close attention to the ISO number range. A digital camera’s ISO number is a direct indication of the potential for light sensitivity that it has. Generally speaking, the typical modern digital camera’s sensitivity can be freely adjusted from the single digits, all the way up to six-figure numbers. The camera’s level of exposure determines the amount of time that the shutter remains ajar at the moment a picture is taken. If you prefer a higher amount of light, then you’ll want the shutter to remain open for a longer amount of time; this will mean that you want a camera that has high exposure. While a high amount of exposure increases the amount of light, the trade-off is that it creates a proportionally higher rate of blurriness as well. On the other hand, if you’re not concerned about letting in a large amount of light, then a higher exposure rate isn’t what you’re looking for. A lower exposure rate is meant for reducing a photos blurriness by closing the shutter rapidly. A camera’s aperture is how widely the shutter opens when taking pictures. With a lower aperture level, you won’t get as much light into your photos, but at the same time, the photograph’s field depth will be increased. A deep field depth creates an effect where the objects in both the background and the foreground are equally balanced in the detail, though this may not always be the desired effect. When the field depth isn’t very deep, then objects in the foreground will be much more richly emphasized then the objects in the background that aren’t meant to be the primary object of focus. Depending on what type of photograph it is that you’re looking to take, a greater field of depth may or may not be exactly what you’re interested in having. In addition to the differences in ISO and shutter speed, cameras are heavily distinguished by the difference in the sharpness of their lenses. No matter how impressive the internal specs may be, a camera needs a certain quality of glass to optimize how well it can filter the light that it captures. The best way to interpret a camera lens’s sharpness is to think about just how well separated the edges and colors are. It can be challenging to lock down exactly what sets two different lenses apart at a glance, as a big part of lens performance has to do with other correlative settings. You can reliably gauge some measure of the lens quality by paying attention to the materials. Higher-end lenses will generally have highly durable material on the outside that encapsulates genuine glass on the inside. The manufacturers of cheaper cameras will usually forego glass and robust materials for full plastic construction, which saves money but reduces the camera’s survivability and sharpness. While there are some cameras with plastic lenses that can still perform impressively well, it’s still wise to take the lens material into consideration. There are all kinds of powerful and affordably priced cameras out there to make high-quality photography more accessible to the average consumer, but the quality of your pictures will ultimately come down to your preferences. Many enthusiastic hobbyists rely too heavily on the megapixel count to judge a camera’s quality before committing to their purchase, but the subtler factors like aperture and ISO are almost always more important. Always be sure to visualize how your personal picture-taking style will mesh with the camera’s light sensitivity, and you’ll be much closer to doing your vision justice in high-quality photographs.